As I got immersed in the day-to-day trappings of tech-focused jobs, my fine arts skills got stale. I decided to reinvigorate them with a challenge. 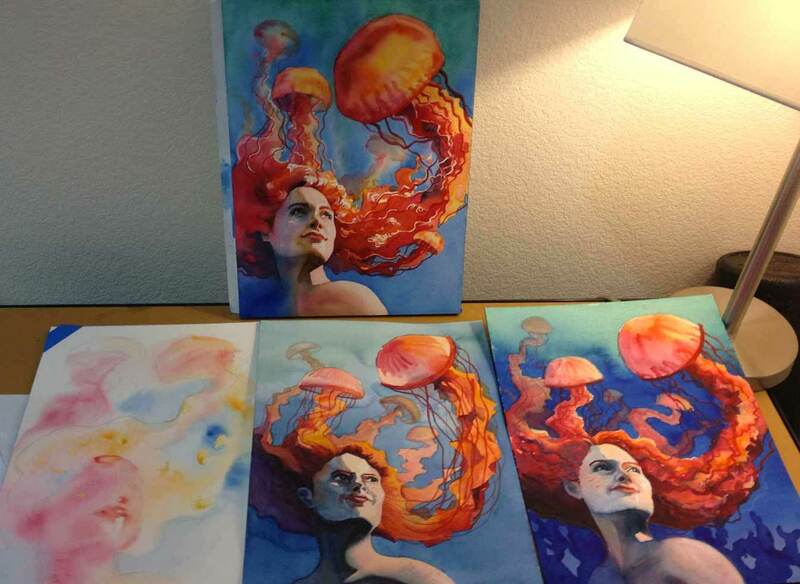 In 2011 I took up one of those make-a-thing-everyday-for-a-year projects, choosing watercolor as my weapon of choice. By forcing myself to paint watercolor nearly every day, I built up my skills from “sorta bad” to “decently good.” Eventually, I fell in love with it. Today I paint almost exclusively in watercolor. Something else happened during the course of that year-long project, though. As my watercolor skills improved, so did my efficiency with product prototyping. My newly acquired job, at the time, required me to develop interactive prototypes on a near-daily basis. I’d been having trouble moving myself from a traditional waterfall way of thinking to a rapid prototyping one, but the more I worked with watercolor, the easier prototyping became. I’m by no means a prototyping guru, but I’m much more effective at it than I was before my watercolor-a-day project. While learning anything new will rewire neurons and inspire creativity, I’m convinced that it was the watercolor medium itself that helped me become a better prototyper. 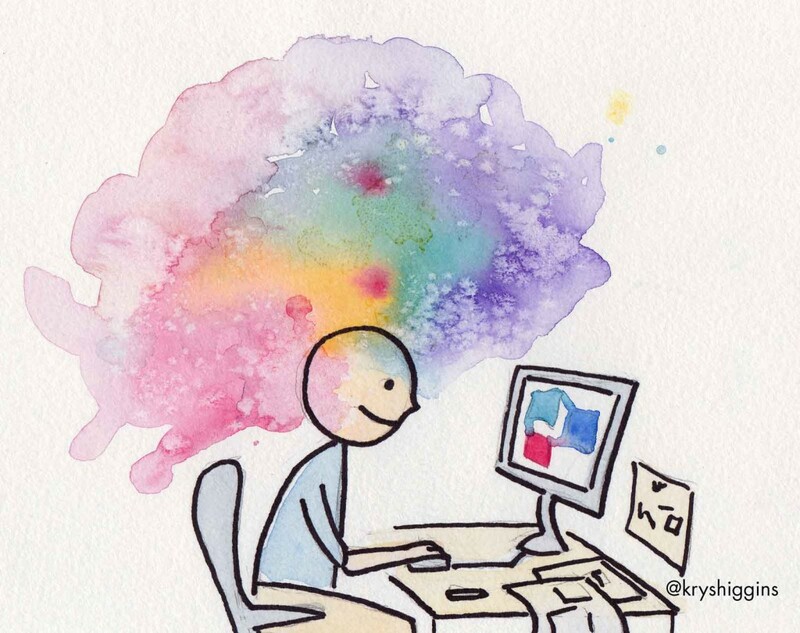 Here are a few ways that I observed watercolor painting facilitating a prototyping mindset. Acrylic, oil, pastel, pen, pencil, digital — all of these media are relatively easy to rework. They can be erased or opaquely layered. When I used to paint with acrylic, I got into a habit of spending weeks fretting over a single canvas. Many of my early paintings ended up muddy or noisy as I continually reworked the same areas, layering on globs of paint. Any interesting concepts I might have stumbled upon earlier in the process were covered up, lost under all of that acrylic. But watercolor cannot be easily reworked. New layers can’t cover up prior decisions. Everything is transparent. If you want to change course, you must start on a new sheet of paper. Iteration is a requirement for success. 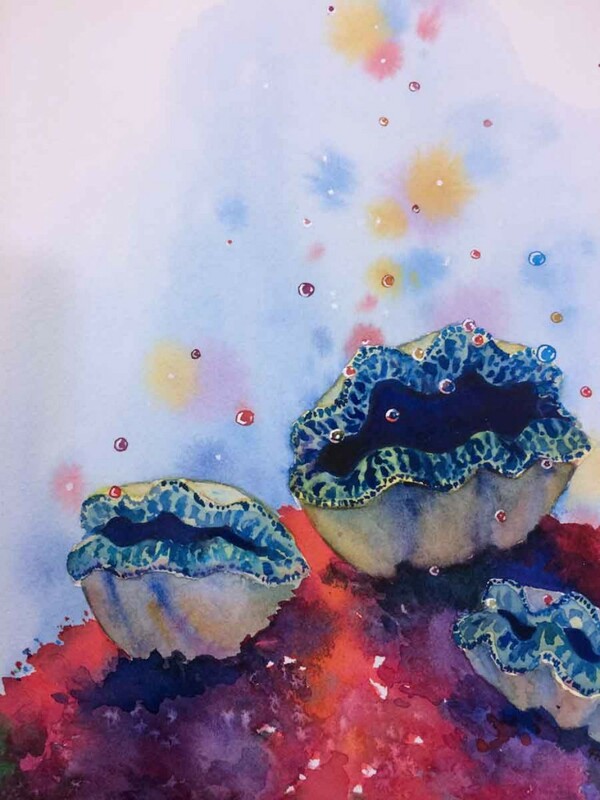 When I started painting in watercolor, I stopped fearing failure; I wasn’t abandoning my art when I needed to move on, but practicing techniques that could be applied to the next version. I built up a library of prior studies I could refer to for future ideas. Good art instructors encourage iteration no matter the media at hand (in Austin’s Butterfly, first grade students are shown how iteration helped perfect an illustration over time), but it is watercolor that truly forces it. You also can’t be a successful prototyper without iteration. It’s not about perfecting a single piece, but about exploring new ideas and learning along the way. 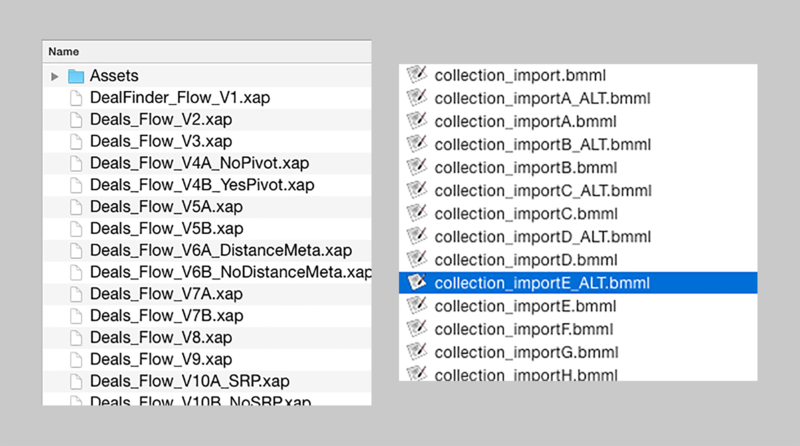 Keeping multiple versions allows you test variations with research participants. You can critique more effectively with your team. And you develop a compilation of earlier versions that might be useful to pull from when you need to build future products. Watercolor is fickle and prone to mistakes. It’s also serendipitous. Blemishes might appear. One color may bleed into the next more heavily than anticipated. Granulation may occur. Underlying paper defects may show through. Variations in air temperature and humidity can cause unexpected washes. Good watercolor painters develop a knack for recognizing valuable mistakes and changing the focus of a piece to incorporate them. You build prototypes so that you can validate a product direction, and feedback may change that direction. 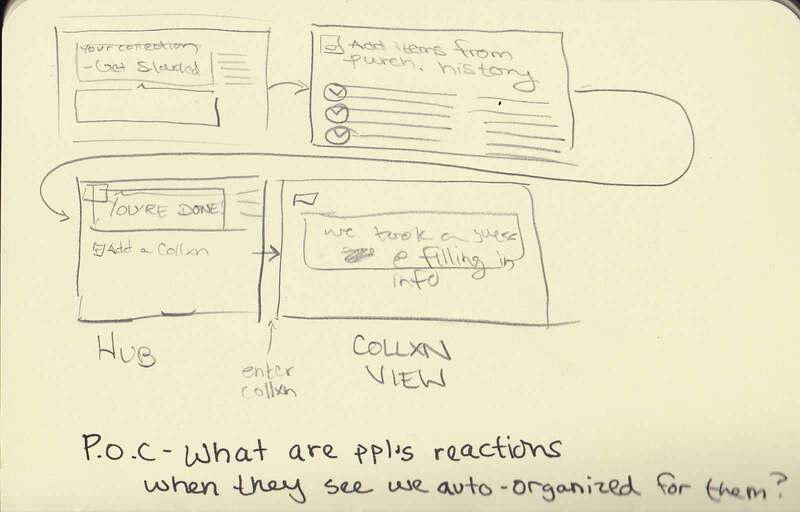 Prototyping gets ideas in front of users quickly, and they may react in unanticipated ways. By keeping an open mind that allows you to treat mistakes as opportunities, you can pivot one prototype idea into a new one. Because watercolor is fickle, getting a desired result requires planning. For example, if you’ve never painted trees, start by exploring the different ways you might achieve a foliage effect. Prototypes should also be properly scoped. While it may be fun to start hacking away, prototypes are supposed to be a cheap and fast learning mechanisms. Focus only on building what you need to convey an idea. Do you need to validate a detailed UI interaction, or a high-level product concept? I’ve learned to sketch and storyboard prototype ideas with my research partners to determine the minimum scope needed to learn what we want to learn. Watercolor’s fickleness also means that it’s responsive. One of the most important things for a painter to learn is to experiment with different tools. Dropping salt on a wet area of paint creates a flowery effect. A toothbrush or atomizer lends a speckled atmosphere. Blowing air through a straw into a damp area creates streaks. You can dribble in tea, dab with a sponge, use frisket to mask off sections, or use plastic wrap. 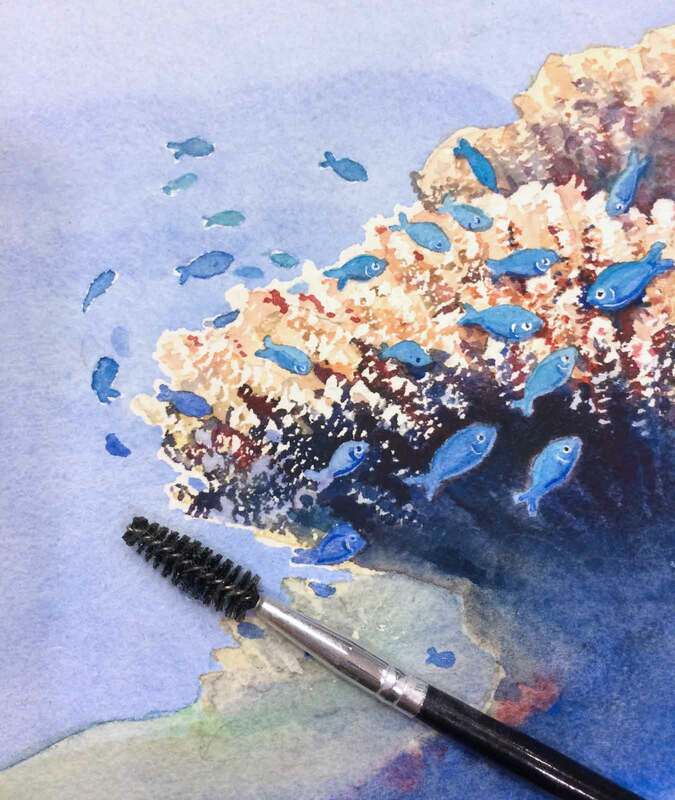 Sticking to brushes alone will put you at a disadvantage. To make branches of staghorn coral in this painting, I used a mascara brush to apply masking fluid and paint. When you’re prototyping, you need to leverage as many tools as you can to communicate your idea. This is not the time for purity of frameworks. It’s OK to grab code from 13 different sources or use 5 different prototyping apps over the course of a design cycle. I prefer “kitchen sink” prototyping, using whatever is easiest to start working in, and whatever matches the fidelity of prototype I need (here’s a great, filter-able list of current prototyping tools from the folks at Cooper). This flow shows how 3 different prototyping tools were used to piece together bits of a flow for a research session. For me at least, watercolor painting boosted my prototyping mindset. It’s very likely that other artistic outlets may lead to the same outcome. For example, improvisational musicians might find some similarities between their work and that of a prototyper’s. 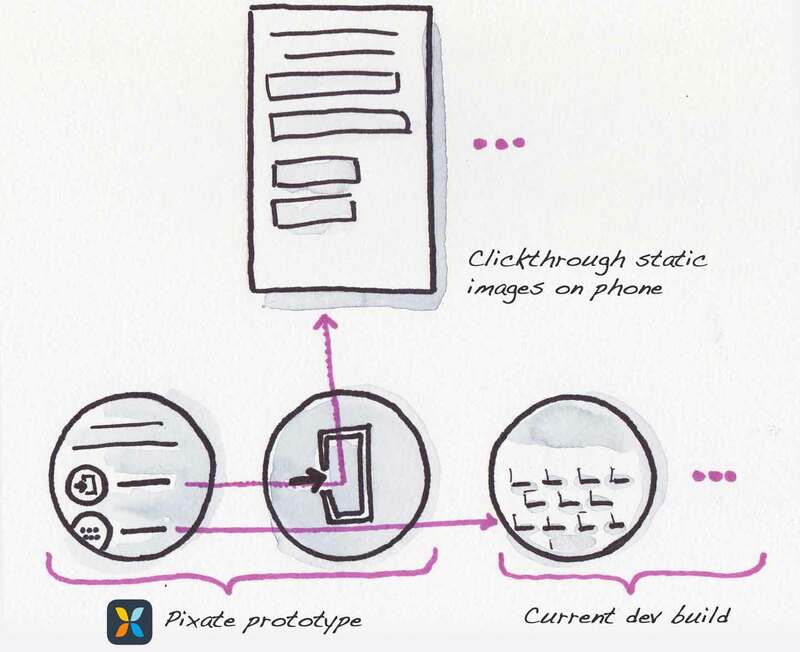 Interested in learning more about prototyping? Here are a few articles and posts that can help you on your way to prototyping goodness. Krystal, this is a really cool blog post. The water colored header image of the guy on the computer caught my attention. I think water color looks cool and stimulates the brain. Thanks for sharing your tips! 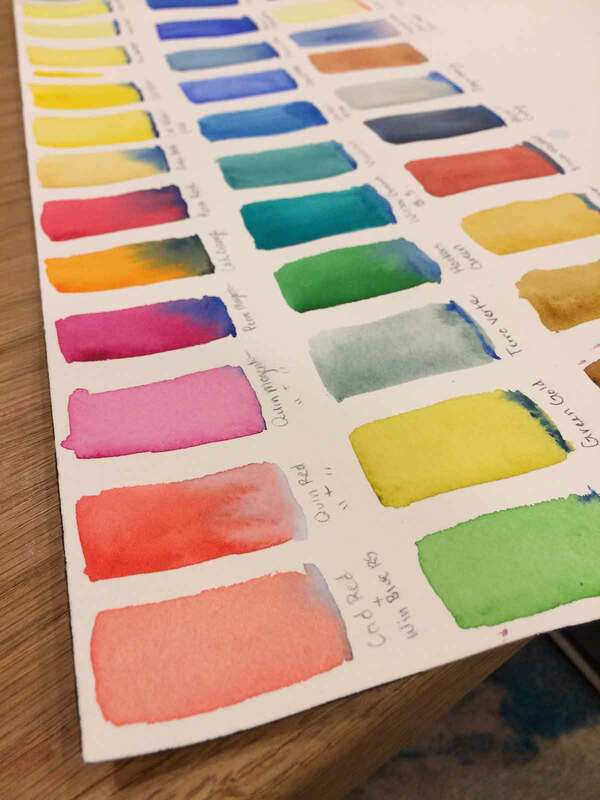 I wonder what the equivalent of watercolor prototyping would be for copywriters?